We arrived in Sarajevo blind. Or at least, I did. I ordered a peach grappa on Thursday night because it sounded nice, and I wasn’t entirely sure what it was. This arrived. I had no idea how I was supposed to drink it. Turns out the smell is significantly more pleasant than the taste, too. So I bought some lemonade and decanted it into that. Bingo: a far more quaffable (if not slightly less authentic) beverage. I’m used to knowing about the country I’m visiting. It’s usually me who’s suggested we go somewhere, and if not, I tend to be excited enough by the idea to have done at least minimal research before hopping on a plane. Bosnia hadn’t even registered a blip on my travel radar. It was so far away from “places I must visit before I die” that I wasn’t entirely certain whether or not it was actually a country. But Peter had studied the war as part of his degree and remained fascinated by 20th-century history – and after he’d grudgingly agreed to visit Morocco with me, and ended up thoroughly enjoying himself (at least in Sidi Ifni, if not Marrakech) – I felt it was entirely fair that this became our next mutual travel destination. It’s not an easy place to reach. We had to fly via Istanbul, most people couldn’t comprehend why Sarajevo was our primary destination, and the airport is minute; a single baggage carousel, three-minute queue for passport control, and one toilet cubicle per gender. We were collected from outside the terminal by Nedzad, our friendly host, and driven to our home for the next two days, past the former Olympic Village: a brutal introduction to the city’s recent bloody history. 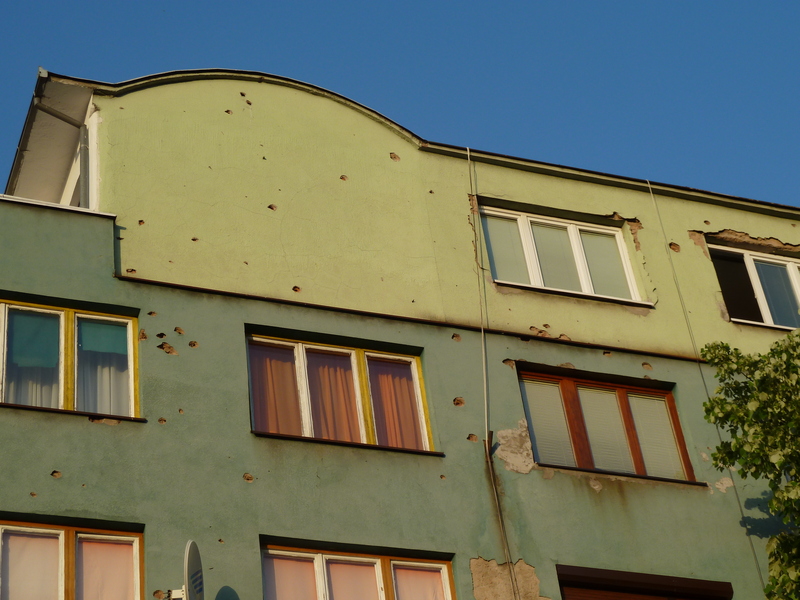 The buildings, now used as apartments, were riddled with bullet holes and had massive chunks taken out of the sides. I hadn’t expected such an immediate and obvious manifestation but the relatively superficial, yet nonetheless sinister damage caused by shrapnel is obvious in every other building throughout Sarajevo. Those which don’t bear it are either brand-new replacements or have been hastily plastered over. I suppose the local residents don’t even see the damage any more, but for newcomers such as ourselves, even in the most affluent parts of town, the war’s most visually obvious appearance is hard to avoid. 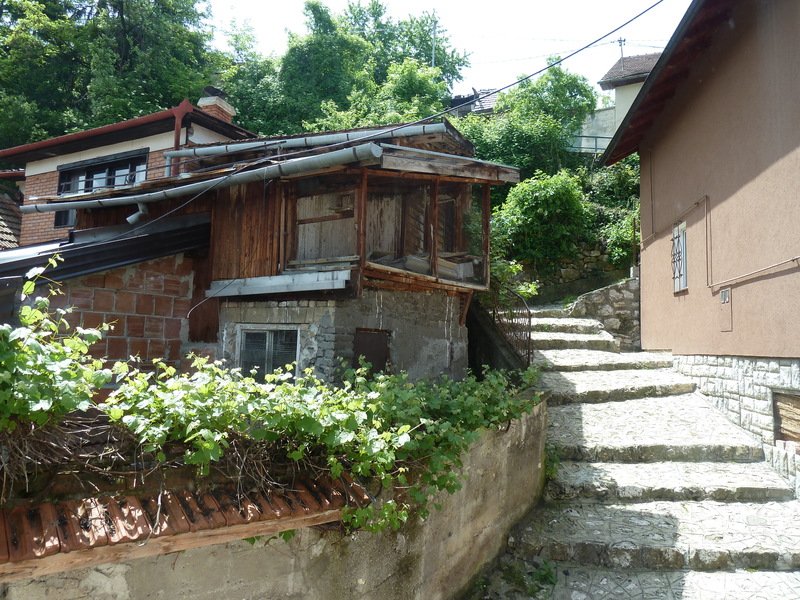 Sarajevo proper is nestled in a valley which feels especially vulnerable. It’s surrounded by five hills, one of which is the location for our current AirBNB place; up some of the steepest streets imaginable, around hairpin bends at what feels like a 45-degree angle. Taxi drivers are unperturbed and Nedzad took the winding, narrow streets at breakneck speed with remarkable agility. Up here, it feels like we’ve gone back in time; cobbled steps and unfinished buildings propped up with wooden struts. Mosques are plentiful, but there is one enormous church further into town. Sarajevo is actually home to the tallest building in the Balkans – an impressive sight from up on the mountains especially – but wandering around the Old Town, buildings are low-rise and rambly and it’s incredibly hard to register that this is a capital city. Admittedly, it only houses 500,000 people but even so, in most places it feels like a village and life seems to move at much the same pace. It’s calm, beautiful, almost quaint – like something out of a Disney film, if with a sheen of half-hidden violence. Many of the buildings remain from the Ottoman Empire, and the rest – razed to the ground by the war – have been rebuilt with immaculate attention to detail. Alleyways are intriguing and hide bars and cafes, serving Turkish-style Bosnian coffee and the not-infrequent shisha pipe. I’ve no doubt that the business centre is more modern and faster-paced but the old town and the river – really a wide, shallow stream – appears to be the city’s heart. Meanwhile up on the hillside, only five minutes away by car, it’s virtually silent and from the window we can see trees and misty hills on the opposite side. As a foreigner, mindful of the past, conscious of the pockmarked buildings, and aware – if only in retrospect – of news stories from the early 1990s, I’m almost embarrassed to find myself surprised at how unhurried, unconcerned, and generally peaceful the city now feels; recent demonstrations notwithstanding, not that we saw any evidence of those. 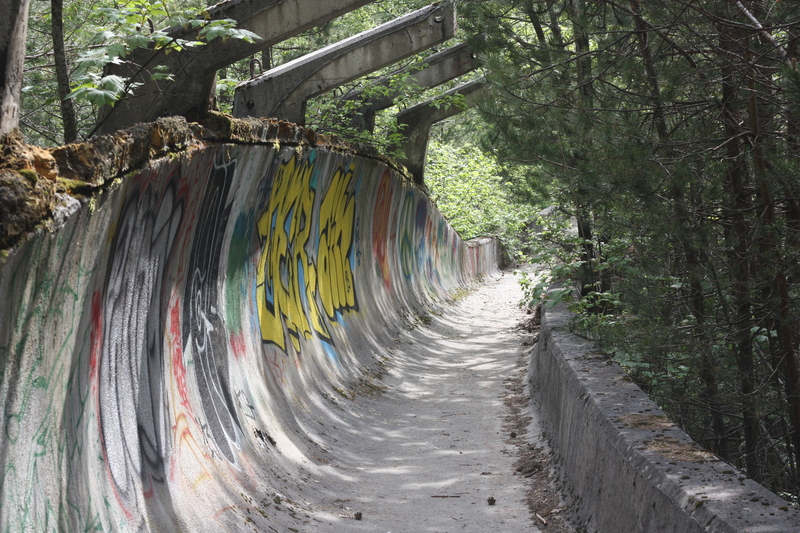 We decided to go and explore Sarajevo’s main source of pride, the remnants of 1984’s Winter Olympics. Many of the structures remain standing on all sides of the city, but Peter had read on some dusty internet forum about a foolhardy person who’d visited the crumbling bobsleigh track and – as a fan of the obscure – I was sold. We didn’t really plan the trip beyond “let’s find a taxi driver and ask him to wait whilst we go and take photos” and flagged down the first one we saw. He seemed surprised by our request, made in an attempted Bosnian pronunciation, and asked to see the destination written down. “60 marks” he more or less barked at us, “30 euros. That’s the price, it’s up to you”. He actually started heading back towards the taxi, clearly not expecting us to agree, but we did, and in we hopped. As we wound away from the Old Town and up into the mountains, Samir the taxi driver thawed considerably and chatted away in heavily-accented English. We learnt that the mountain was – to all intents and purposes – closed to tourists. Nobody visited. The other four mountains, littered with ski jumps and resorts, were more popular in the summer but Trebevic remained off-limits, in no small part due to the very real danger of landmines. We whizzed past burnt-out shells of former restaurants and hotels – “very good view, very good food. Then, it was. But now . . .” – and screeched to a halt on the very edge of a perilous 50 metre drop which, Samir explained, was one of many points from which artillery was fired directly into the town below. We stared uncomfortably down from this disconcertingly good vantage point. A heavily-graffittied husk of a hotel sat forlornly on the mountainside nearby. As we headed further up, the countryside becoming lusher and greener and the few houses ever further apart, we unwittingly crossed the border into Republika Srpska (the Bosnian-Serb enclave that was formed after the war). Peter had read beforehand that many drivers refused to drive from one section to the other, although it was hard to ascertain whether this unwillingness was due to age-old political issues or the physical danger of this lonely countryside. Samir backed this up, cheerfully repeating the words “very dangerous, you believe me” and “no police here” before explaining that from his own perspective, after four years spent fighting in the war, such a journey was neither here nor there. He looked in his 60s but we learnt that he was just 47 – I suppose that’s what spending your thirties fighting a civil war does to a person. Samir’s devil-may-care attitude extended to his driving and he showed no sign of slowing down as we climbed far above the city, passing through a lushly-forested area of land with odd clearings and more destroyed buildings. This had been a popular area for families to visit during school holidays and weekends, for barbecues and relaxation outside the city. Now, thanks to the landmines littering the area, it had been totally abandoned. There was just one other car. 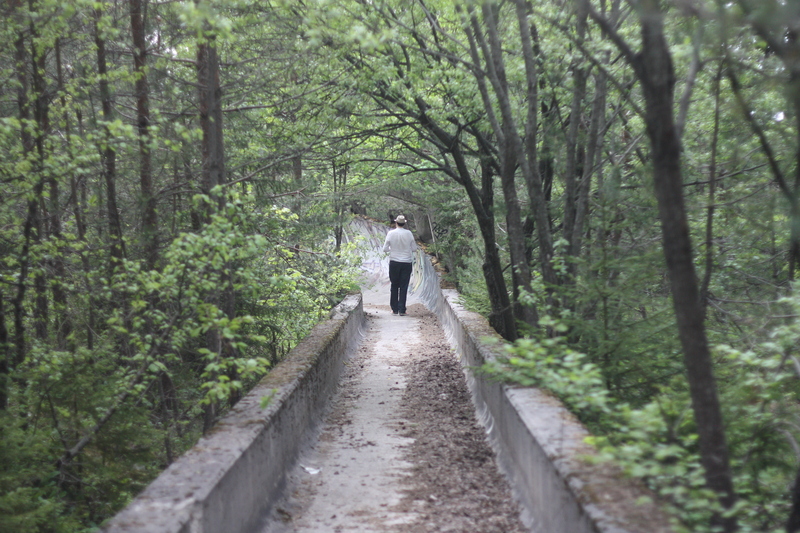 Despite not technically being in Sarajevo, it was probably the saddest thing that I saw; once the site of such innocent enjoyment, now a very real remnant of the war, overgrown, underused, unlikely to ever be reclaimed, and a physical reminder of those war-torn childhoods gone, forever. There’s a reason why Trebevic is now referred to as “The Lost Mountain”. He headed back to the taxi and we took ourselves off down the track. Suddenly alone, in deafening silence, it felt very eerie. Here we were, traipsing along an abandoned length of concrete on which medals were won, records made and dreams achieved. On such a blazing hot day, conceiving of the place covered in snow and ice was even stranger. Moss and lichen clung to the rough sides, and spiders spun delicate webs between rusty metal supports, exposed in places by the shifting ground and occasional bomb. Graffiti artists had got there first, of course, which I rather liked because at least it meant that somebody appreciated this blank canvas. Alongside the main bobsleigh run was a higher, narrower, shallower track which I assumed was the luge but perhaps it had been for a camera. It was only as we returned to Samir (who, thankfully, hadn’t hurtled off back down the mountain as soon as we were out of sight) that I noticed that this concrete lane soared into the air before abruptly returning to earth, snapped straight across. Still tethered in place by the steel reinforcements alone, hanging at a painfully sharp angle, the unsupported end had smashed into the ground and lay in a pile of rusty nails, slivers of concrete, and – bizarrely – what appeared to be bathroom tiles. It was something of a relief to return from the mountain, not least as Samir revealed how unenthusiastic he himself had been at taking us there. “I didn’t believe you wanted to go there” he announced, and kept reiterating how important it was to return before dark. He referenced the war again, but in the neutral terms reserved for living in such close proximity to the dead. 12,000 people were killed, he told us. Life had been better for a while, but not any more. Kosovo took the world’s attention, and Serbia had been keen for everyone to forget about the plight of the Bosnians. But life went on. We passed over a small landslide and saw more burnt-out buildings – but also evidence of new ones, construction work, and a herd of goats. Life, it appears, may be returning. 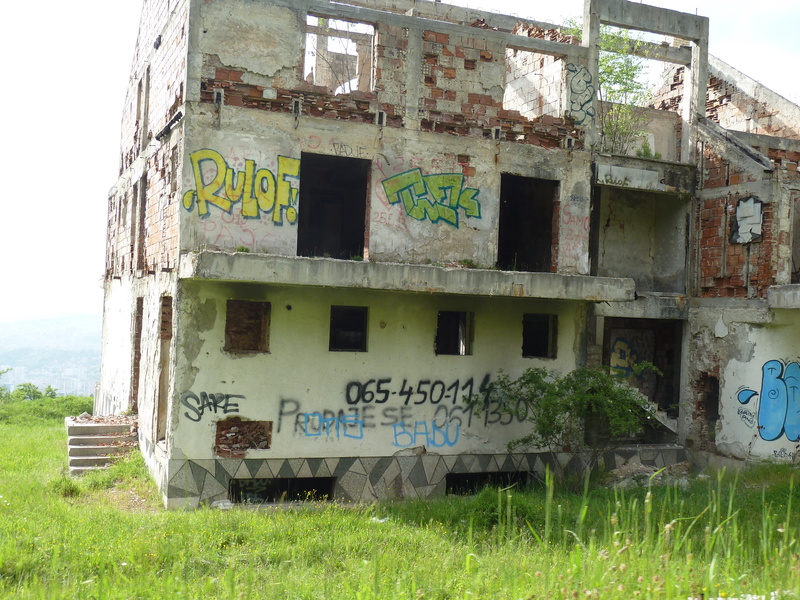 The Bosnian government are looking into converting and reconfiguring old Olympic sites. Perhaps the bobsleigh track and its mine-filled mountain will be amongst them. In the mean time, I’m grateful to have taken that bizarre taxi ride, which showcased arguably the apex of Sarajevo’s achievements, alongside the saddest of its burdens. 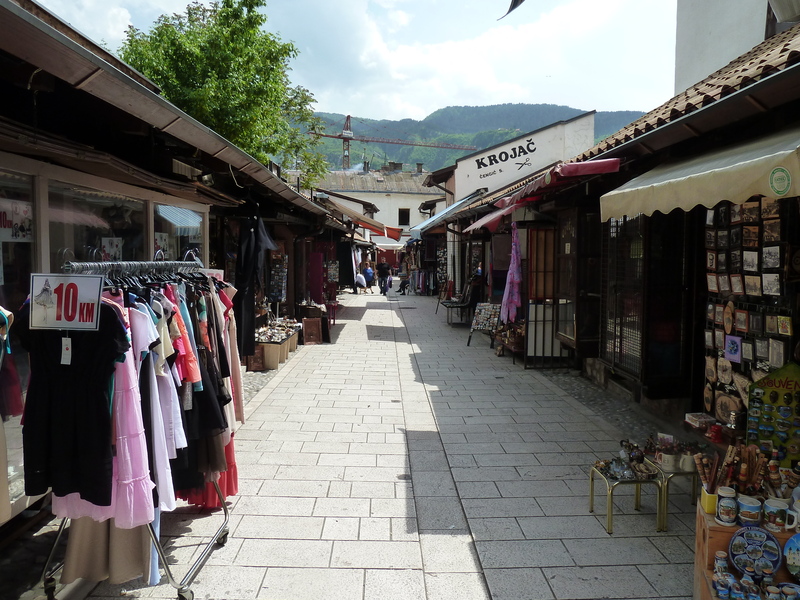 No, Sarajevo was never on my radar, but having now visited, I now can’t imagine why. 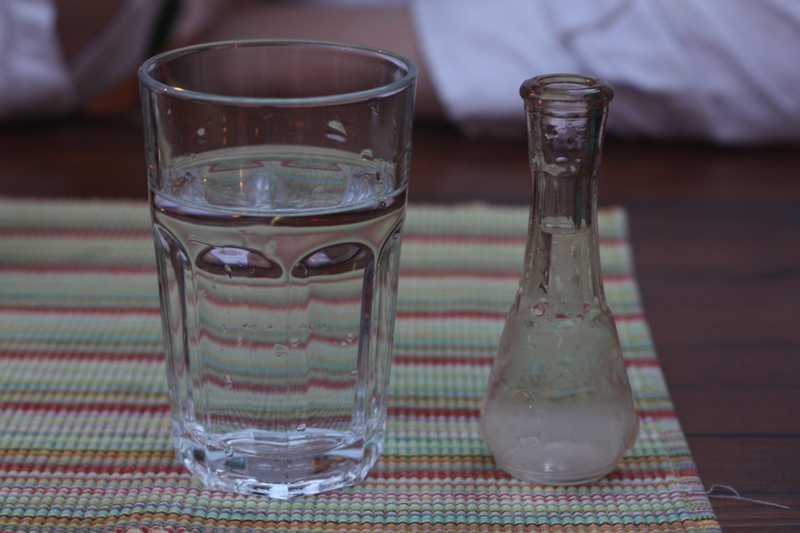 Giovanni, our host in Istanbul, had expressed surprise: “Most people just pass through Sarajevo; nobody goes there”. I guess sometimes, the world just doesn’t know what it’s missing.